This project was started in 2014 by one of our long standing volunteers, it helps local people who have difficulties with accessing services and tools to seek and apply for jobs, and to provide support and advice to prepare for interviews. Our clients include active job seekers who are either young school leavers, those returning to the job market after a lengthy time out of work for various reasons (due to parenting responsibilities or returning from prolonged illness), refugees, those with criminal records/ex-offenders etc. They are likely facing various challenges, such as, a lack of understanding the English language, lack of training and opportunities for computer use, literacy problems left over from their education, specific mental health or learning disability issues, social isolation and low morale or a combination of all these. It uses the development of CV’s as not just a practical tool but also as a way of someone remembering their capabilities and getting used to talking about them. It uses the basics of computer use and the process of job searching as not just an essential process but as an occasion for conversation and sociability. The aim is for people to be able to independently seek and gain employment. 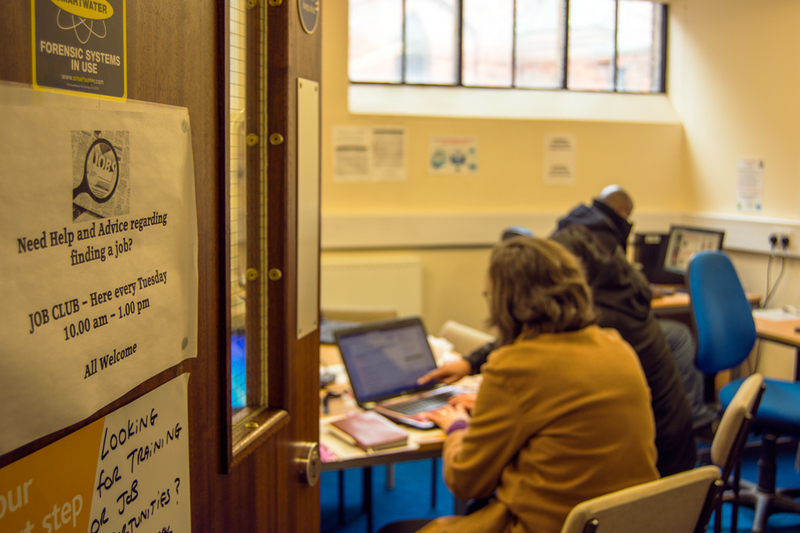 Shortly after the job club project started, it was quickly identified that there was a serious need to add benefits advice to it. And so, we commenced benefit advice services alongside it in 2015. This meant that people were receiving information as to what benefits they were entitled to, how they can apply for it, how to challenge a decision if they felt it was wrong or that they got the wrong award. This has also spilled over into other areas like, housing, school placement applications, and others too numerous to mention here. Since the start of the project, we have relied heavily on volunteers who are supervised by our centre manager. They have brought with them a plethora of skills that has brought about very positive outcomes to the project. They have also acquired skills, references, and made a lot of friends. Aside from success stories by our clients and volunteers of getting employment, there are many other successful outcomes that have come out of this project. People have testified to having increased in confidence, ability to independently carry out job search and applications (electronic & hard copy), and a sense of well being.